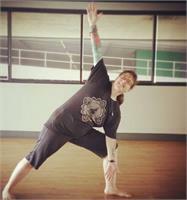 Laura Rebecca is an 200-hour certified Experienced Registered Yoga Teacher (ERYT-200). She is trained and experienced in Power Yoga, Yin yoga, Restorative Yoga, Yoga Sculpt, and Hot Yoga (her personal favorite format). She has been teaching yoga in Los Angeles since 2013; prior to teaching yoga, she taught Martial Arts/Self Defense in NY for 13 years, and is a 3rd degree black belt in Jujutsu. Some injuries that had accumulated over the years led her to Hot Yoga as a means of therapy, and she has never looked back. Laura enjoys sharing the healing benefits of heated yoga with people of all ages and ability levels, and her classes are known to feature precise instruction, classic rock tunes, and a sense of humor.